Earth finds itself under attack from an invading alien force in the form of classic video game characters. 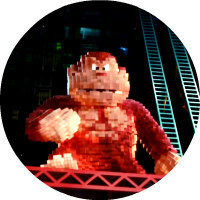 "It's interesting that in Pixels, nostalgia literally comes back to destroy us - pop eating itself like Pac-Man chewing down pellets - but I'd probably be giving the film too much credit should I suggest this is an intended subtext." In 2010, an animated short film, Pixels, took the internet by storm with a series of images of New York City seemingly being invaded by classic video game characters like Pac-Man, Donkey Kong and Space Invaders. Hearts went aflutter in the bodies of those of us who grew up in the '80s. It was a two minute nostalgia trip, one that contained more innovation in its two minutes than an entire summer season of blockbusters. Hollywood saw pixelated dollar signs and so now we have a feature film cobbled together from this most basic of concepts. With a plot device blatantly lifted from Galaxy Quest, Pixels sees our planet invaded by an alien race which misinterpreted a video time capsule launched into space in 1982, featuring footage of video games popular at the time, as a provocation to war. The aliens have turned their warriors into representations of the characters from those video games, attacking earth in the guise of Galaga, Centipede et al. When the military proves useless, the President of the US (Kevin James) calls in his boyhood friend, one-time ace video gamer Sam Brenner (Adam Sandler) for some unique assistance. Along with fellow gamers Ludlow (Josh Gad) and Eddie (Peter Dinklage), Sam puts his childhood skills to use in an attempt to fend off the invading pixelated hordes. With Hollywood so terrified of taking risks lately, we've seen nostalgia mined to its core, as studios hope middle-aged viewers will be willing to spend money reliving their childhoods while introducing their own children to the entertainment properties of their youth. It's interesting that in Pixels, nostalgia literally comes back to destroy us - pop eating itself like Pac-Man chewing down pellets - but I'd probably be giving the film too much credit should I suggest this is an intended subtext. Pixels isn't the outright travesty early reviews suggested; it's merely mediocre, which is just as annoying, given the potential of the concept. The film has its share of clever moments, but it's constantly undermined by a laziness that fills the plot with inconsistencies and anachronisms. We're told the aliens are basing their knowledge of earth solely from a 1982 time capsule, but many of the pop culture references hail from later in that decade. The aliens communicate through old TV footage, which is a wonderful conceit, and flawlessly rendered, but if this footage was part of the time capsule, why would Madonna be included, given her first album wasn't released until 1983? Initially we're told the aliens can only contact us through 1982 technology, with Gad's conspiracy nut finding a hidden message on a VHS tape, yet later they send their messages through Plasma TVs! All the villains remain pixelated throughout, except for a fictional heroine who morphs into a very human Ashley Benson without explanation. Many of the video game characters come from games released well after 1982. If the filmmakers wanted to simply riff on the entire decade of the '80s, why couldn't they just have had the time capsule sent in 1989? Admittedly, those are the quibbles of someone who spent their childhood ingesting '80s pop culture, but isn't my generation the target audience for this nostalgia trip? If you're going to throw us a bone, at least leave some meat on it. The lack of attention to detail doesn't make Pixels a bad movie, merely a frustrating one. By Adam Sandler standards it's a masterpiece. Sandler takes a back seat himself, but other characters are given far too much time for comedic showboating that all too often falls flat. Gad and Dinklage are funny guys, but the material foisted on them is rambling and in dire need of an edit. There are some gags that are initially amusing in concept, such as a nervous Gad turning into R Lee Ermey's Full Metal Jacket drill instructor when asked to address a platoon of Navy SEALS, but they're run into the ground. A good 15 minutes could easily be shaved off the film if these shambling comedic set-pieces were trimmed down. 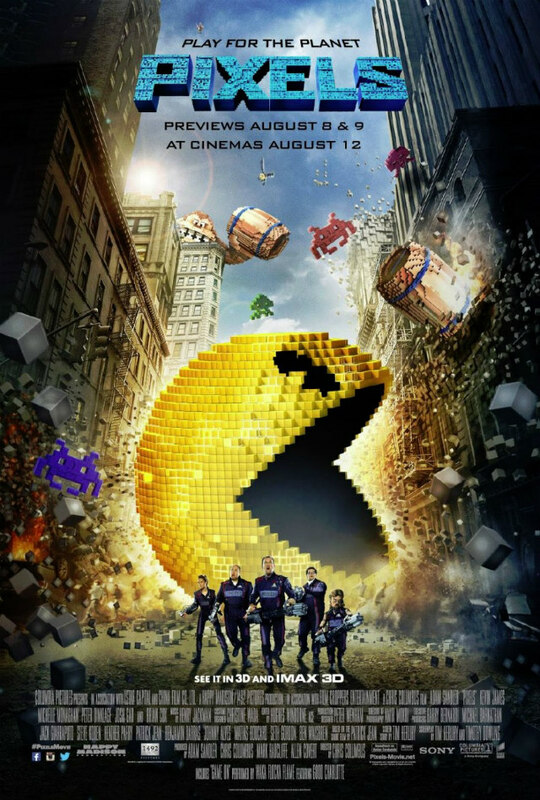 In the hands of a devoted fan-editor, Pixels may well re-emerge in the murkier parts of the internet as a tight, 85 minute, fun slice of summer blockbuster fun. A sequence involving Pac-Man that turns the streets of Manhattan into a game grid is as enjoyable as anything you'll witness at the multiplex this summer, and seeing the skies over London transformed into the layout of a Centipede level provokes genuine awe. These moments, however, are tempered by ego-boosting improv and kid-friendly toilet humour (we're treated to the sight of pixelated piss). For movie lovers, and fans of classic arcade games, Adam Sandler is the ultimate end of level baddie.